I’m gearing up for having baby #3 in just a few weeks! In preparation, I’ve been a bake-a-holic and freezing most of what I make for post-baby. We’ll have all sorts of treats and things when we’re sleep deprived and hungry. Plus, I know it’ll be some time until I get back into the groove of baking after this baby arrives. I don’t want my boys to go without yummy baked goodies just because I’m exhausted! Can you say spoiled? 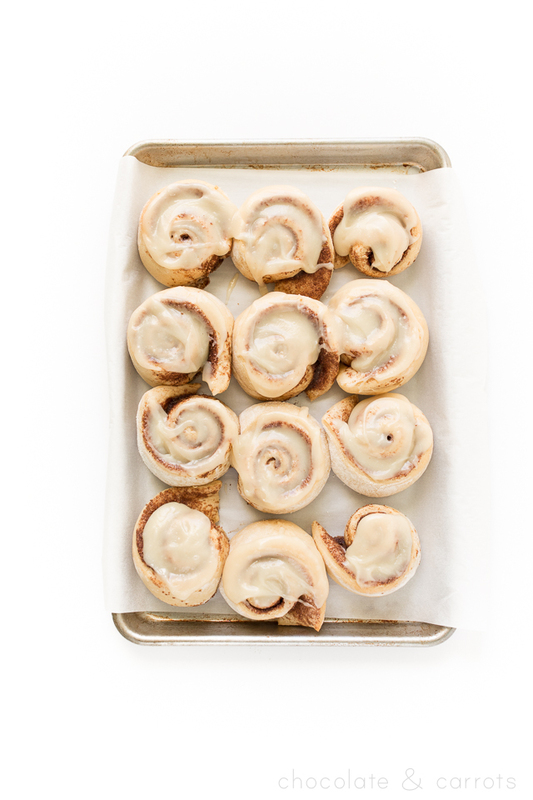 These cinnamon rolls are a fan favorite at our house. Just be sure to please, please, please read through the instructions before you get ready to bake. 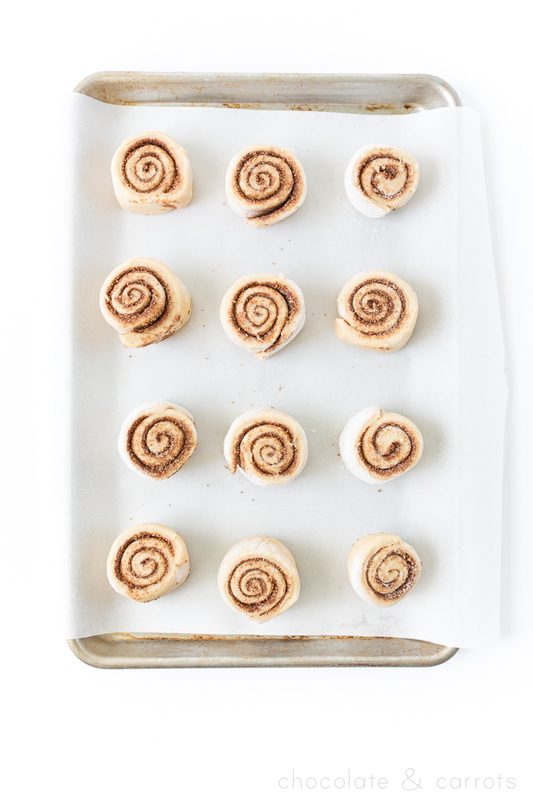 This is a rule you should prepare for with any recipe, but should definitely be done prior to early morning cinnamon rolls…especially when it comes pre-coffee. Haha! I just love waking up and it literally taking one hour from start to eating to have homemade cinnamon rolls on the table. Enjoy! 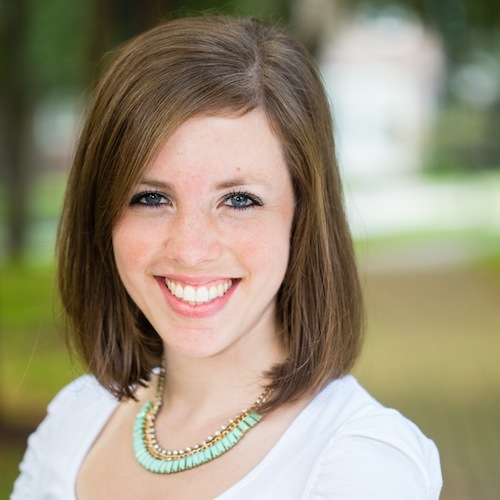 And in celebration of my upcoming maternity leave, I’ve joined in with some fellow bloggers for a special giveaway! Be sure to enter below! DOUGH In a small bowl, microwave the milk and butter together for one minute. Stir and if the butter isn’t completely melted, microwave for another 20 seconds (repeat until butter is melted). Allow the milk/butter mixture to cool for a few minutes until you can stick your finger in it and it feels like a warm bath. To speed up this process, I pour the mixture into my metal mixing bowl from my stand mixer to cool it faster. Once the milk/butter mixture is warm, but not hot to the touch (i.e. you can stick a new finger in the mixture and it doesn’t hurt to leave it in here for 2 seconds), whisk in the yeast. Next, Add in the whole wheat pastry flour, 1 cup of the all purpose flour, sugar and egg. Using the dough hook attachment of your stand mixer (or a spatula if not using your mixer), turn it on low until the ingredients are combined and the dough begins to make a ball. At this point, you’ll need to add 1 tablespoon of the remaining 1/2 cup of all purpose flour to the mixer until the dough stops sticking to the bowl. Once the dough is a ball and is no longer sticking to the edges of the bowl while it’s spinning, turn the speed up to a medium-low and allow the mixer to knead the dough for 5 minutes (or if you’re doing it by hand, knead on a floured surface for 5 minutes). FILLING Meanwhile, spray a large bowl with oil and set aside. During this time, you can also, combine the filling ingredients (sugars and cinnamon) in a small bowl. Set aside the softened butter, as well. Note: If you didn’t leave your butter out to soften, you can always microwave the butter for 5 seconds at a time or until the butter is softened enough to be easily spreadable. FIRST RISE Once the dough is done kneading, place the ball of dough in the greased bowl and cover with a damp towel. Allow it to rest in a warm place (I put mine on my stove, which is directly above the preheating oven) for 10 minutes. ROLLING THE DOUGH While the dough is resting, preparing a surface for rolling out the dough. I use a long sheet of parchment paper on my counter for easy clean up. Sprinkle the surface with flour and have your rolling pin ready! Once the dough has rested, pour it onto your floured surface, sprinkle with flour and roll into a large rectangle. You’ll want to aim for about 14 x 9 inches, but as close to that as you can get it is fine. Once the dough is rolled into a rectangle, spread the softened butter evenly over the dough. I like to go all over the rectangle, reaching every edge. Sprinkle the cinnamon sugar mixture evenly over the butter. 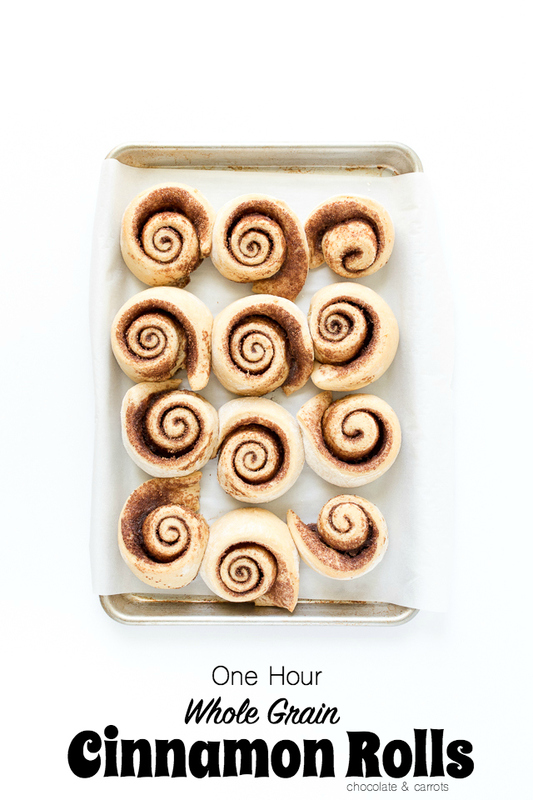 Rolling along the longest side of your rectangle, to make a really long cinnamon roll (instead of a shorter one), gently roll into a tight roll. Using a serrated knife or a string of dental floss, score and cut into 12 equal rolls (I discard the small bits on the end that don’t really make a cinnamon roll. 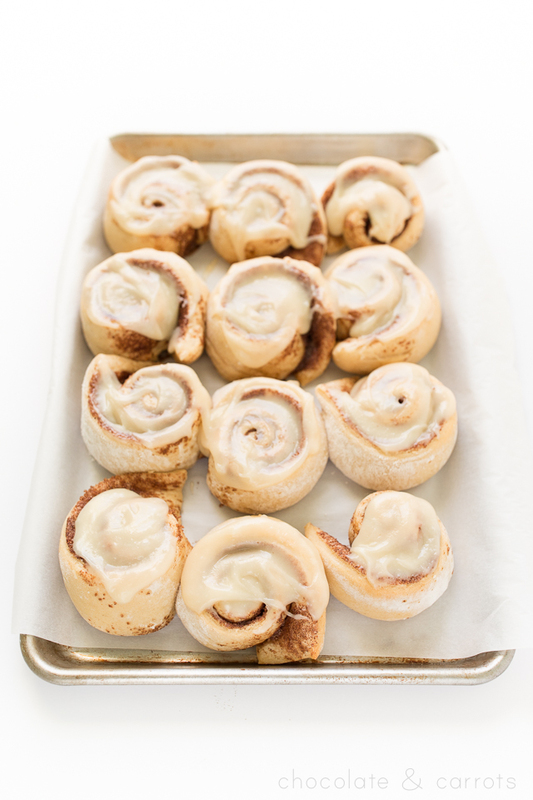 SECOND RISE Place the cinnamon rolls on a parchment or non-stick foil covered baking sheet and cover with the damp towel. Allow the rolls to sit in a warm place for 25 minutes. BAKE Once the rolls have rested, bake for 15-20 minutes or until lightly golden brown. FROSTING While the rolls are in the oven, beat or whisk the frosting ingredients together (start with the cream cheese, butter and vanilla first and then whisk in the powdered sugar). 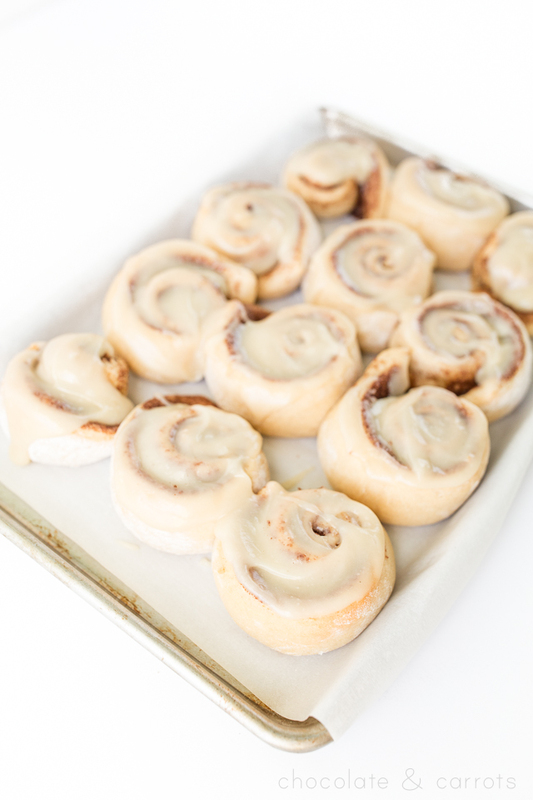 Once the rolls come out of the oven, spread the frosting on top and enjoy! To save the rolls for later, either store them in an airtight container in the refrigerator for up to 3 days or gently place them in a single layer in two freezer gallon bags and freeze for up to 2 months. Take one out at a time and microwave for a quick homemade breakfast!